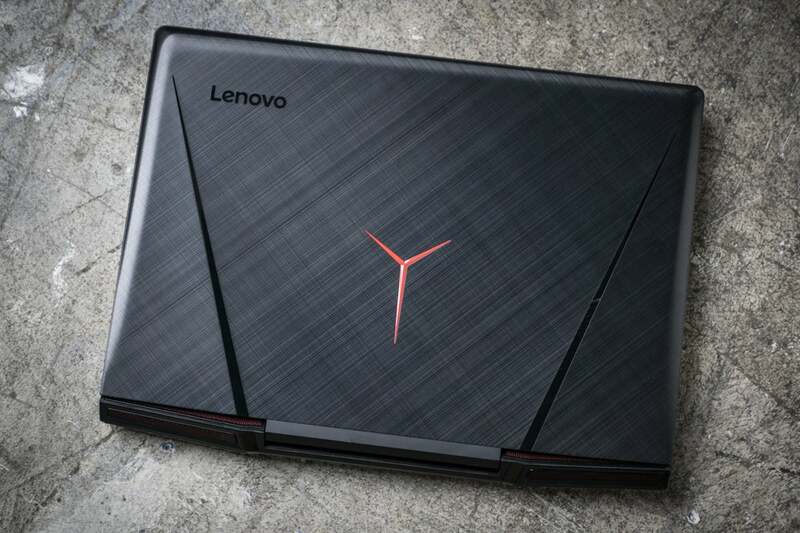 The Lenovo Legion Y920, with its full-on GTX 1070-calibre graphics, a bright 17-inch screen, and a mechanical keyboard, makes for a solid—and quite hefty—gaming laptop. 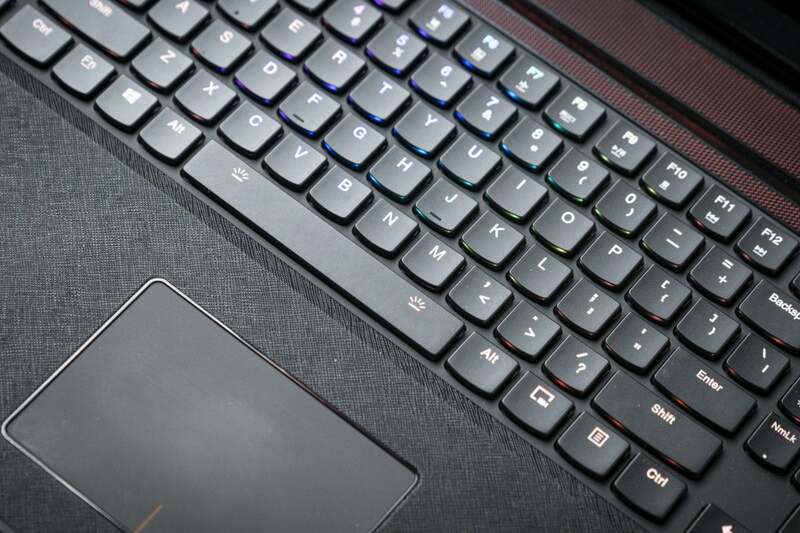 Besides its premium mechanical keyboard, the Y920 boasts some enticing amenities that its competitors lack, such as a one-touch Turbo mode and Dolby Atmos sound. It’s a good machine, but shop wisely. Gamers focused purely on the visuals may balk at the Y920’s hefty price tag, particularly given that a similarly configured version of the Alienware 17 R5Remove non-product link (not the maxed-out version we reviewed) currently costs many hundreds of dollars less. You’ll also see 17-inch gaming laptops with newer CPUs than its 7th-generation overclockable part. Note: This review is part of our roundup of the best laptops. Go there for details about competing products and how we tested them. 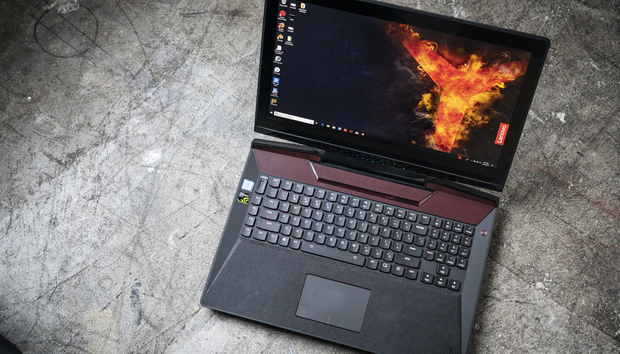 The Lenovo Legion Y920 (more specifically, the Y920-17IKB) packs a quad-core, seventh-generation Intel Core i7-7820HK processor and a middle-of-the-road Nvidia GTX 1070 graphics core, both of which you can overclock a skosh by nudging a “Turbo” switch. You also get a 17.3-inch full-HD and G-Sync-capable display, 16GB of dual-channel DDR4 RAM, a 512GB solid-state drive, and a 1TB 5,200rpm hard drive. A note on pricing and availability: Lenovo is no longer selling this model directly, but the company confirmed it was still available on Amazon and other third-party online retail channels. Its price tag is something of a moving target. One day, it was about $1,950 on Amazon, then the price jumped to about $2,110 a few days later. Newegg, meanwhile, has been selling the laptop for anywhere between $2,100 and $2,660. That said, if you’re pining for a gaming laptop with a mechanical keyboard (not a guaranteed feature) and easy-as-pie overclocking, the Legion Y920 might be worth the extra cash. 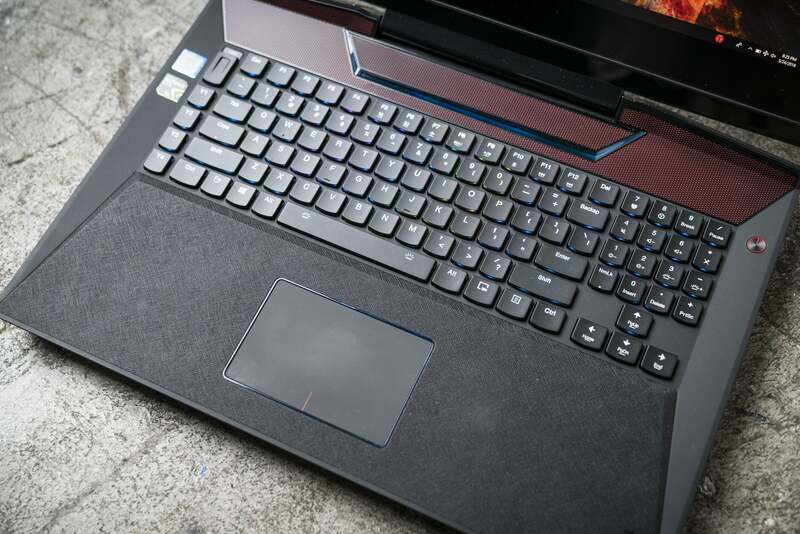 The Lenovo Legion Y920 features a brushed-aluminum lid with the ‘Y’ logo. The Lenovo Legion Y920 is about as hulking as you’d expect for a desktop refill, tipping the scales at more than 9.5 pounds and measuring a roomy 16.17 x 12.4 x 1.42 inches. Once you add the massive power brick, you’re looking at close to 12 pounds of hardware. Open up the Y920 and you’ll find a nifty maroon speaker grille sitting above the mechanical keyboard (more on the keyboard itself in a moment). The keyboard’s RGB backlighting boasts a trio of customizable presets, ranging from a soothing “wave” effect to a pulsating ripple whenever you strike a key. Both zone and single-key backlighting are also on the menu. The Lenovo Legion Y920’s backlit mechanical keyboard includes a 10-key keypad and a large trackpad. Sitting in the top-left corner of the keyboard is the Y920’s Turbo Boost switch, which lets you overclock both the CPU and the GPU on the fly. Thanks to the Y920’s one-touch Turbo Boost feature, you can overclock the CPU’s maximum clock speed from 3.6GHz to 4.1GHz, while the GPU can go from a top clock speed of 4GHz to 4.1GHz. We’ll take Turbo Boost for a real-world spin in a moment. While it’s not 4K, the Legion Y920’s 17-inch, 1920x1080 display looks bright and sharp. The screen brightness measures an enviable 360 nits (or candelas) according to our readings, well above our minimum standard of 250 nits for comfortable indoor viewing. Viewing angles on the Y920’s IPS-technology panel were pretty good, with only moderate dimming starting from around 45 degrees or so. We saw no signs of inverse colors as you’ll see on cheap laptop displays. I did notice a little backlight bleeding along the top- and bottom-right edges of the screen, particularly when the screen was completely black. I found it minimally distracting, and I didn’t notice it at all during intense gameplay. That said, those who can’t unsee even the smallest screen defect should take heed. Boasting roomy, slightly concave keys with 2.2mm of travel distance, easy discovery, a 10-key numeric keypad, and yes, some pretty snazzy RGB backlighting effects, the Y920’s keyboard makes a great first impression—and yes, we’re talking a mechanical keyboard here. The Y920’s keys have a clicky, somewhat heavy feel. That’s good news for typists, who generally get a kick out of clicky keyboards, but not so great for those gamers who prefer smooth, linear key switches, which allow their fingers to flutter over the keyboard. The Lenovo Logion Y920 includes a mechanical keyboard, the favored type for serious gamers. The Y920’s trackpad sits directly in the middle of the chassis, meaning it’s a little to the right of the main keyboard due to the numeric keypad. The backlit trackpad requires quite a bit of pressure to click, making for a heavy feel mirroring that of the keyboard. The trackpad is surrounded by a rubberized palm rest with a crosshatched design that, while comfy, tends to attract little bits of debris. Armed with a pair of top-firing JBL speakers, a three-watt subwoofer and Dolby audio processing, the Lenovo Legion Y920 comes with impressively loud, robust sound as far as laptops go, although I was disappointed by the cramped soundstage. Indeed, the Y920’s sounds almost monaural while playing music and games, although you can hear the stereo separation if you bend your ears close enough to the speakers. My usual test tracks—”Live and Let Die” by Paul McCartney and Wings, along with Mozart’s 25th Symphony—sounded rich, detailed and even somewhat bassy, although I did notice a little speaker vibration at high volumes. If you find yourself missing surround effects from the Y920’s speakers, you can always plug in your headphones for a full-on Dolby Atmos experience, which makes your head feel like it’s swimming in sound. The Lenovo Legion Y920’s 720p webcam sits in the top bezel of the display. It captures relatively sharp video given its resolution, perfect for Skype chat or even low-budget Twitch streaming. The Lenovo Legion Y920’s left side includes DisplayPort, HDMI, Thunderbolt, RJ-45 ethernet, and two USB 3.0 Type A ports. If you’re a fan of USB 3.0, you’ll love the selection of ports on the Lenovo Legion Y920. On the left side of the Y920, you’ll find two of a total of four USB 3.0 ports, along with a rectangular power port, DisplayPort, full HDMI, Gigabit ethernet, and—sad face—a single Thunderbolt 3 port. 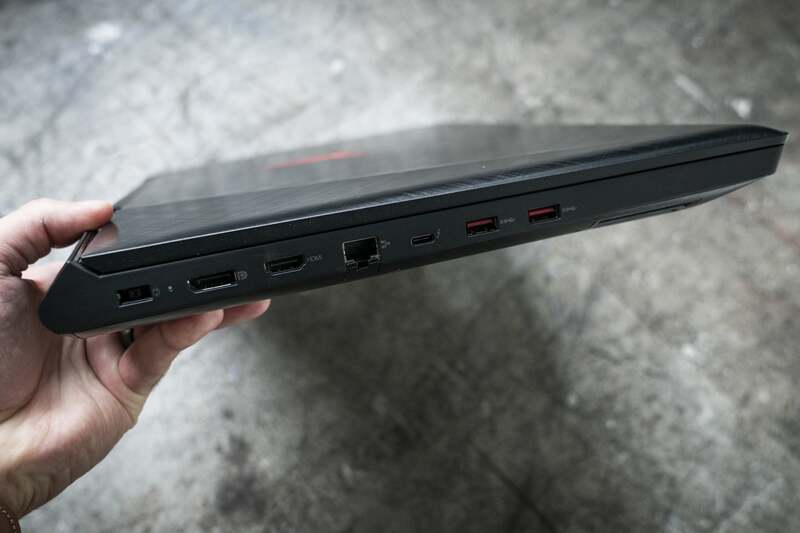 The Lenovo Legion Y920’s right side includes an SD card slot, separate microphone and headphone ports, two USB 3.0 Type A ports, and a Kensington lock slot. We didn’t find any big surprises while putting the Lenovo Legion Y920 and its quad-core, Kaby Lake-era Core i7-7820HK processor through its paces. 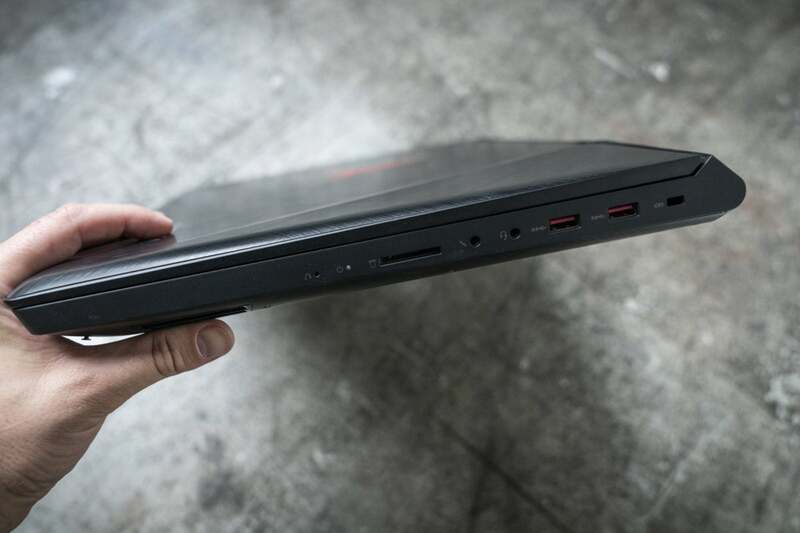 We compared it to other recent 17-inch gaming laptops we’ve tested, a variety that includes the maxed-out Origin PC EON17-X and Alienware 17 R5 (both costing over $1,000 more than the Legion Y920, and for good reason); the prior-generation Alienware 17 R4, which is closer to the Legion Y920 in specs; and the HP Omen 17 and MicroCenter PowerSpec 17, which carry 7th-gen CPUs as well. For the Legion Y920, we include results for both its default and Turbo modes. Our HandBrake test, which involves converting a 30GB MKV video file into an Android tablet-compatible format, turns up the heat for even the most powerful CPUs. 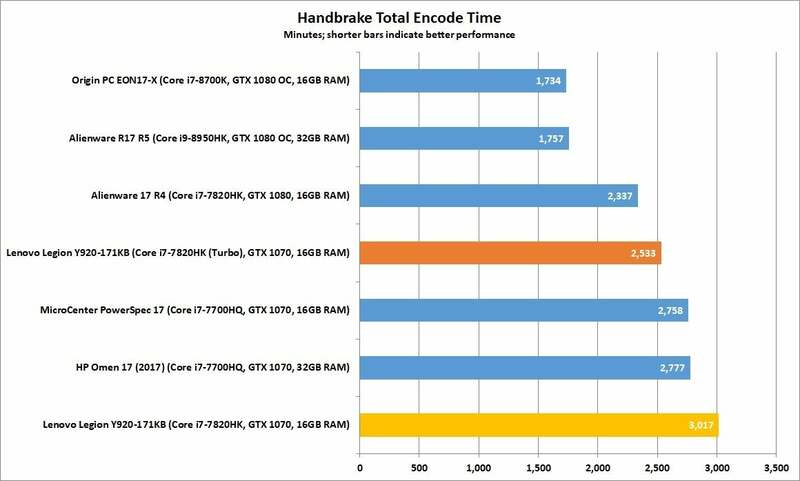 The Lenovo Legion Y920’s Turbo CPU mode made a big difference in the CPU-intensive HandBrake test, coming in well ahead of its time in default mode. The Y920’s HandBrake result is a little on the “meh” side. Generally speaking, we’d like to see a score south of 3,000 seconds (or about 50 minutes) on a laptop with a Core i7-7820HK (such as the older Alienware 17 R4 in the chart above), which didn’t happen in the laptop’s default mode. Once we switched on the overclocking Turbo Speed mode, we got the score down to about 2,500, a 16-percent improvement. Still, the Y920’s so-so, non-overclocked HandBrake mark hints at a fairly conservative approach when it comes to keeping things cool. Another punishing test for multicore CPUs, our Cinebench benchmark pushes laptop processors to the limit as it tasks a system with rendering a 3D image. Whereas our HandBrake test tells us how a laptop deals with heat over an hour or so, the five-minute (give or take) Cinebench benchmark gives us clues how a particular system performs under short bursts of stress. 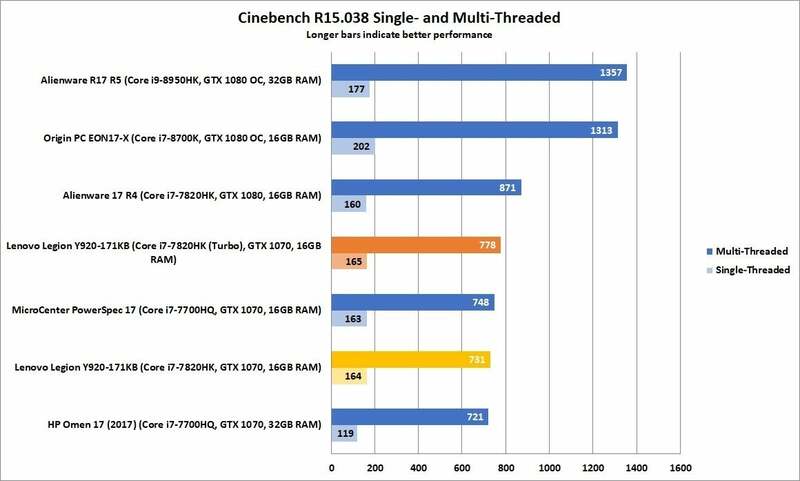 Turbo boost helped a little bit in the CPU-focused Cinebench test, but the Lenovo Legion Y920 mostly hung with the pack. Again, we see the Lenovo Legion Y920 in the mix but a tiny bit behind the pack, although the laptop’s numbers look marginally better (6.4 percent) with Turbo Boost mode engaged. With its mid-range Nvidia GTX 1070 graphic core, the Lenovo Legion Y920 turns in solid performance when it comes to playing our favorite AAA gaming titles, cranking out buttery visuals well north of 60 fps at maxed video settings. 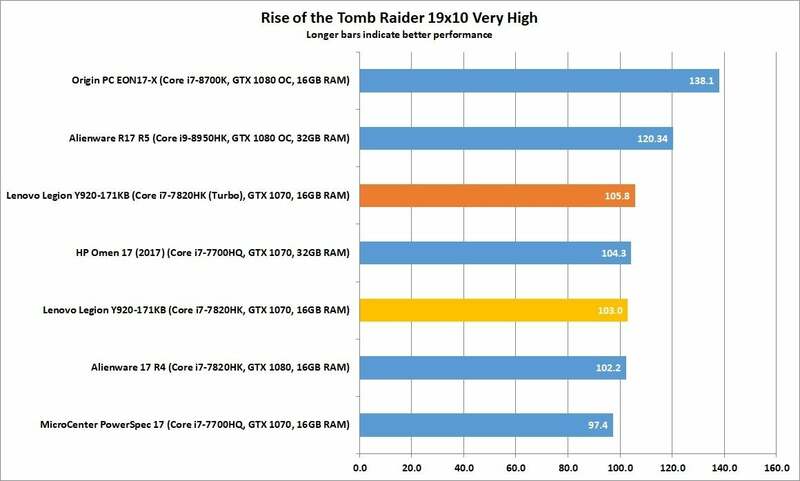 Just don’t expect the Y920’s Turbo mode to juice frame rates beyond a few percentage points. Looking at our 3DMark FireStrike Extreme results, the Lenovo Legion Y920’s performance landed pretty much where we expected, slightly ahead of the similarly GTX 1070-equipped HP Omen 17, but well behind laptops with beefier Nvidia graphics cores (such as the Alienware 17 R4). When we flipped the Y920’s Turbo switch, we saw only a slight (1.7 percent) improvement in its score. Turbo mode didn’t always do much for the Lenovo Legion Y920. In 3DMark Fire Strike, its score (while good) barely changed with the boost. Next, we fired up 2013’s Tomb Raider reboot. Once again the Legion Y920 is pretty much on the mark, edging the HP Omen 17 and keeping pace with the Microcenter PowerSpec 17, another GTX 1070-powered gaming laptop. Engaging Turbo mode only gave us a slight 1.3-percent performance boost. 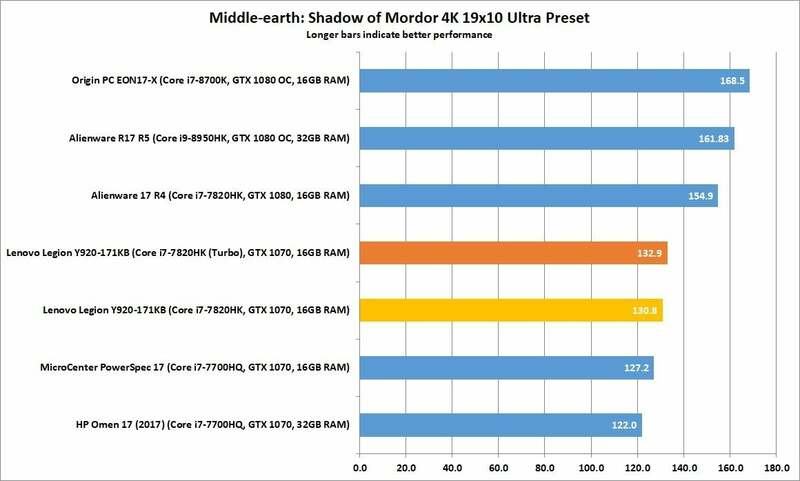 Moving on to Middle-earth: Shadow of Mordor, the Lenovo Legion Y920 managed to serve up a steady 130 fps—slightly better than what we’ve previously seen with the GTX 1070-equipped HP Omen 17 and Microcenter PowerSpec 17. 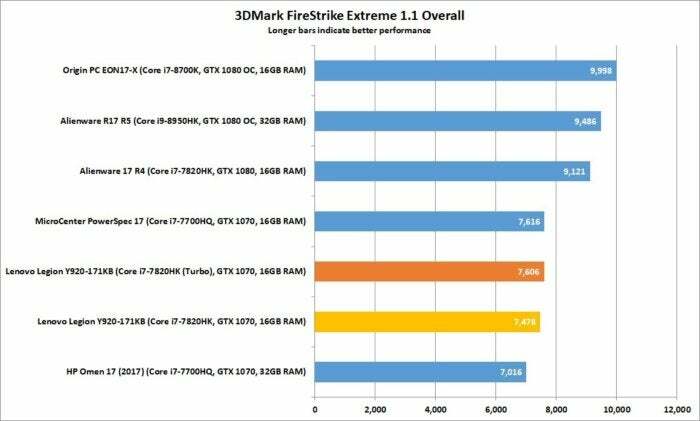 Flipping on Turbo mode netted a small 1.6-percent performance boost, which (not surprisingly) wasn’t quite good enough to match the stellar frame rate of GTX 1080-equipped competition. Lenovo somehow squeezed a bit more out of its GTX 1070 GPU than similarly configured competition, but the GTX 1080 laptops stayed well ahead. 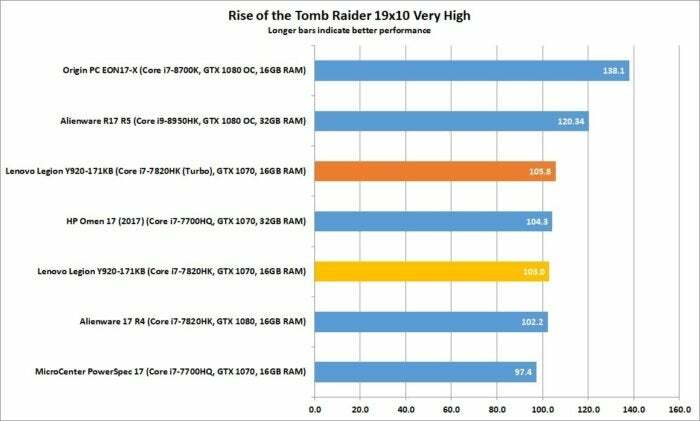 Finally, the graphically intense Rise of the Tomb Raider kept the Legion Y920 to about 103 frames per second, on a par with the GTX 1070-packing HP Omen 17 and the Microcenter PowerSpec 17, and even in range of GTX 1080-powered machines. Turning on Turbo mode gave us a modest 2.7-percent fps improvement. 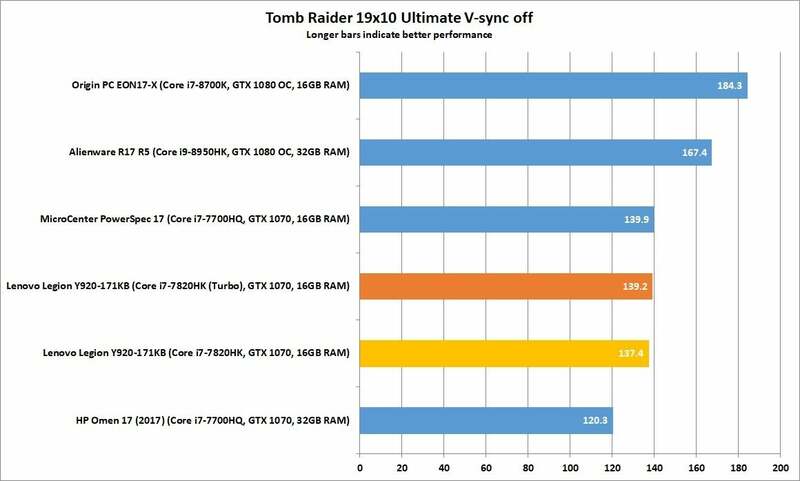 The Lenovo Legion Y920 again stayed with its GTX 1070-fortified pack on the more demanding Rise of the Tomb Raider. You can’t really expect stellar battery life from a hefty, power-hungry gaming laptop like the Lenovo Legion Y920. The laptop didn’t serve up any surprises here. We measure battery life by looping a 4K video using the stock Windows 10 Movie & TV player. We set screen brightness at about 250 nits (or about 91 percent, in the Y920’s case) and set the volume halfway with headphones connected. You chould never expect much battery life out of a gaming laptop, but the Lenovo Legion Y920 lagged noticeably behind some peers. 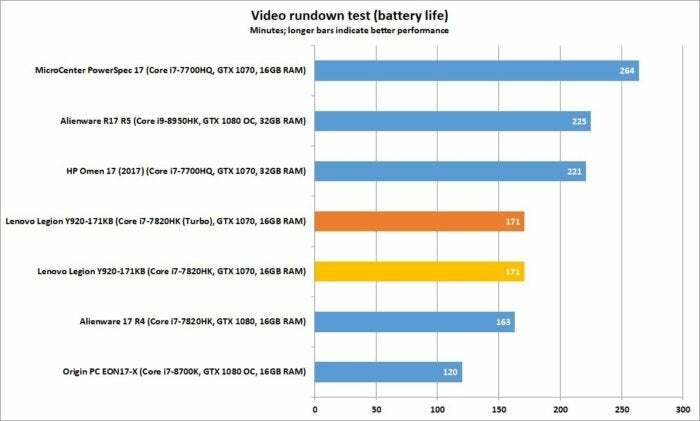 We’ve seen desktop-replacement gaming laptops that can barely last 100 minutes during our battery-drain test. While the Y920 and its 84-watt-hour battery lasted an additional hour and change, it couldn’t break the 200-minute mark achieved by a few other big-and-heavy gaming laptops.